The René module wouldn’t strike anyone as something that’d turn into a big hit. This is an esoteric little device: a grid of touchplates and a bunch of knobs, which you then spaghetti-wire into other modules to make, uh, odd patterns. But making weird patterns you can then shift around – well, that’s a lot of fun. And René liberated modular rigs from onze of their major weaknesses: too often, people were stuck with rigid step sequencers that produced overly repetitive loops that would drive you insane. Basically, the “Cartesian” bit is, instead of having a line (those marching steps), you get a grid (x + Y). So, here comes the René refresh. This is three-dimensional chess to the original model’s checkers. The new model is three channels instead of one, three dimensional sequencing instead of two, and boasts expanded memory so you can save up to 64 states – no more long modular performances that sound great for the first three minutes and then … sort of exactly like that for the next hour, too. The Z-Axis on René is not an expression/pressure control input— it allows for the sequencing and addressing of up to 64 States of stored programming. As the old René was the first to introduce Cartesian sequencing (plotting non-linear sequences based on X and Y position clocks), the new René adds a Z-axis for sequencing of X and Y positions across up to 64 unique iterations! We will have videos covering the Z-Axis in the days and weeks ahead (and the module’s manual will be online soon, too), which will hopefully clear up any confusion about this new level of sequential control. Thanks, Pete! Yeah, that will be worth checking up on, as it’s a clever idea. Correction: an earlier version of this article misstated what the z-axis was about. Combine this with three channels of output, though, and you can in fact route a lot more control from this one module than before. And no doubt the additional memory will be useful in performance. Of course, since the René first came out, it’s gotten a lot more competition. So it could be fun to see how this stacks up against other modular (and desktop, or software, even) sequencers. René is available to preorder for US$525. Since that’s my monthly rent, it’s worth saying Eurorack is still pricey relative to some lower-cost desktop hardware, to say nothing of computers. Clever software patching is great if you’re broke, or if you’ve a little scratch, something like Five12 Numerology. But that said, this no doubt will go high on people’s shopping lists in the modular world – and it’s an impressive piece of work. Look forward to seeing more. Oh yeah – there’s a GIF, too. And yes, I promise to get what the letter ‘z’ is about. For real. The post A favorite sequencer gets more dimension: new Make Noise René appeared first on CDM Create Digital Music. Anthony Bourdain died in June while filming the 12th season of Parts Unknown and the episodes that were completed before his death will air later this month. The emotional trailer was released and for fans of the celebrity chef this will be a heartbreaking watch. The renowned chef, best-selling author, and beloved TV host only fully completed one episode of the final season of Parts Unknown. The one finished episode complete with narration by Bourdain was the journey to Kenya with comedian and fellow CNN TV host W. Kamau Bell. “The greater context of the show and the reality and the fact that Tony’s gone makes that like a — it’s like a punch in the gut,” Bell added as he fights backs tears during the video. There are six episodes total for Season 12 including Spain, Indonesia, West Texas, and Manhattan’s Lower East Side. The other uncompleted episodes will feature staff and friends remembering Bourdain. Bourdain died on June 8, 2018, where he was found dead from an apparent suicide by hanging himself at Le Chambard hotel in Kaysersberg, France. The 61-year-old culinary personality was filming an episode in nearby Strasbourg and his body was discovered in the hotel room by his friend and fellow chef Eric Ripert. Last week, Bourdain and the Parts Unknown staff won six Emmys for the previous season of the travel TV show. The final season of Bourdain’s Parts Unknown will begin on September 23 at 9 pm ET. The new thing from Sweden now at last starts preorders now, with a ship date in mid October. The first batch are already gone, but at least we know these things are making their way into the world. it’s even harder. over the last year we have re-worked and re-thought in absurdum, but now when three long years of development have finally come to an end, we feel quite confident that you will actually thank us for that extra long wait. why? you might ask…– because the result is just pretty, pretty great. Hands-on sessions at Moscow’s Synthposium – the surprise in-event this year for synth lovers – in fact confirmed the pretty-greatness of the OP-Z. The jumbo candybar form factor of this synth recalls the Teenagers’ other flagship, the OP-1. 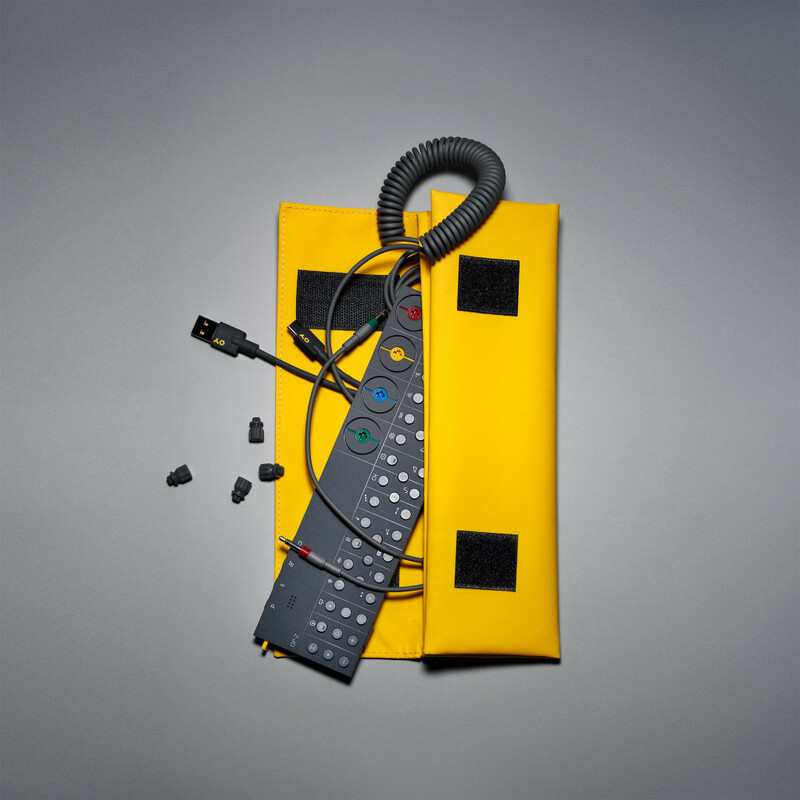 But it’s safer to say that the OP-Z brings together a lot of what the design shop have been about over the years. 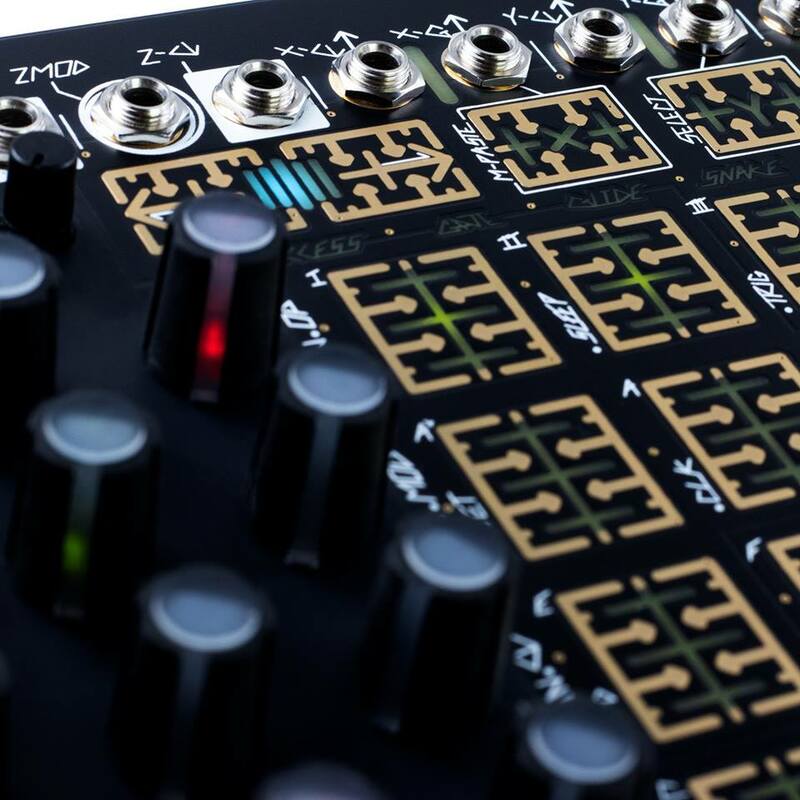 There’s the lineage from the machinedrum and the early Elektron days, and its emphasis on design, rectangular corners, minimal controls, and grooves embedded into hardware. There’s the reduced calculator-style layout and key controls as we saw on the Pocket Operators. You have the unmistakable design aesthetics, introduced on the OP-1 but continually improved with collaborations with the likes of IKEA. So the OP-Z looks more stylish and design-conscious than anything else on the market. But that’s not nearly as important I think as the way Teenage Engineering have increasingly mixed gaming metaphors, particularly from the Nintendo legacy, with music. It plugs into a bigger display, in a throwback to old consoles and PCs. 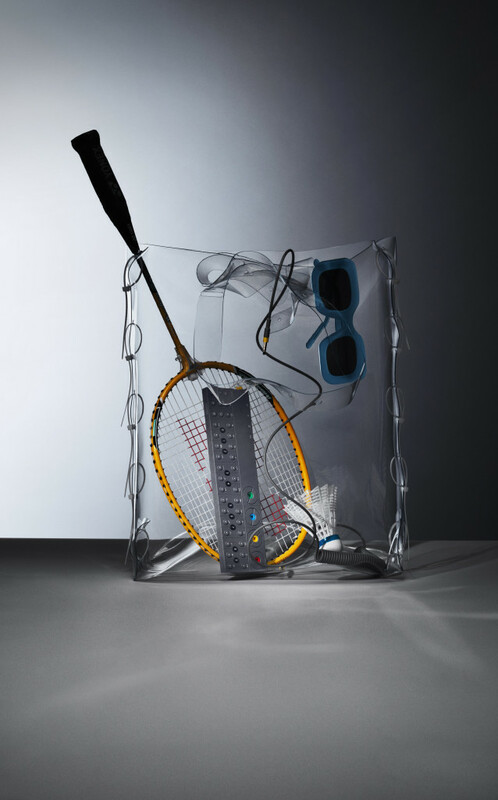 And it suggests that an electronic musical instrument is a game and a tool at the same time. The visual possibilities, meanwhile, are captured more clearly in Japan, and … those features sound better in Japanese, I think. * Side note: once upon a time, I projected a graph of awesomeness vs. shippingness, specifically regarding the OP-1. Seems it’s still a curve you have to fight – but it can be defeated even with awesome stuff. I’m not an IKEA hater, and I’ll never be. There’s a reason they’ve become such a success. Their pieces are functional and affordable, and there’s something to be said for that. IKEA also basically put flat-pack furniture on the map, which is a win for all of us. Other companies have followed suit, and if you’re looking for something that might last a little longer than IKEA’s entry point pieces, you’ve come to the right place. We rounded up some of the newer kids on the block when it comes to flat-pack options, and from the looks of things, these companies’ pieces have real staying power potential. Take your storage game up a notch with Kvell, a modern furnishings company that launched back in 2017. Most of their products pack flat, including an assortment of storage cubes, ottomans and occasional chairs. Several are also collapsible, meaning they’re clutch in small spaces. Kvell’s Nordik storage lounge chair and matching storage ottoman, for example, are two pieces that offer hidden storage in the seat, utilize flat pack construction, and boast an assembly time of just a few minutes. Color is another strength of this line—there are tons of on-trend options from wine and mustard to navy and flame orange. And the prices aren’t crazy. The founders of Campaign felt like there was a gap in the market for flat-pack, assembly-required furniture that didn’t feel disposable. Point taken. If you live in a city, chances are you’ve seen a MALM dresser or KLIPPAN sofa laying out on the curb on moving day. So building on the idea of “campaign furniture”—quality mobile pieces created for 19th and 20th century British soldiers out on military campaigns—all of Campaign’s furniture can be set up in 15 to 20 minutes with one to two people and no tools. The brand focuses heavily on seating: Sofas, loveseats, chairs, and ottomans, but all items are made from American steel, hardwood, and sustainable fabrics in a variety of colors. And Campaign hits the longevity angle by offering extra cover and leg options, so you can update your piece if you tire of the finishes you originally chose. “It all started with four legs,” reads the Floyd website, referencing the fact that this company got its start making metal legs you could clamp to any surface to create a table. In that respect, Floyd feels the most DIY and industrial of all the flat-pack brands here—those steel legs and brackets are still a part of all of their offerings. But since then, they’ve expanded their collection to include a bed, a table, a side table, a desk, and coming soon, a sofa. So they cover more categories of product than most of their competitors. Shipping is free, and same-day delivery is available in certain cities. If modular furniture is your thing, then you’re going to love Burrow, a New York-based sofa, chair, and ottoman company. All of Burrow’s pieces are made from sustainable wood and chemical-free fabrics, plus the packaging, which looks like cardboard suitcases, is made from recycled components. Burrow doesn’t offer quite as many color choices as the others, but they’re among the most affordable and literally look like their pieces snap together, so sign me up. And there’s definitely a millennial vibe here, too. The arms of the chairs and sofas have hidden integrated USB chargers, the cushions are reversible, and you can add or remove sections of a sofa as your needs change, which is brilliant. Think of HEM as kind of like IKEA’s cooler older cousin. This Swedish design house announced plans for a fully flat-pack sofa, the Kumo, and a flat-pack conference table earlier this year, and they should be rolling out any day now. I wouldn’t call HEM affordable exactly, but it’s not outrageous, and the more flat-pack pieces they offer, they cheaper they’ll be here in the states. But if you want to give off major Scandinavian modern vibes, HEM’s pieces definitely have a little more style and point of view to offer than the rest of the bunch. What other flat-pack brands are you loving right now? One of my favorites, Greycork, shut down last year, so clearly there are still challenges in this space. But I’m hopeful that more companies will get in the game. 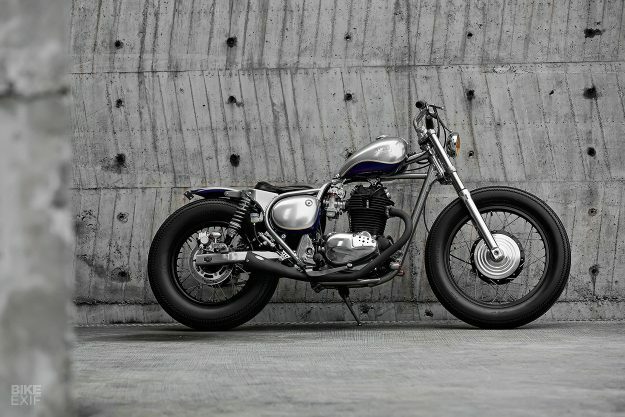 A test of ability in the world of bike building is being able to turn the banal into the beautiful. It’s hard to go wrong if you have a Ducati SportClassic up on the bench—and there’s a reason you don’t see many custom Honda Valkyrie Runes. The streets of Japan are full of inoffensive and forgettable commuter bikes, and one of the most common is the Kawasaki BJ250. 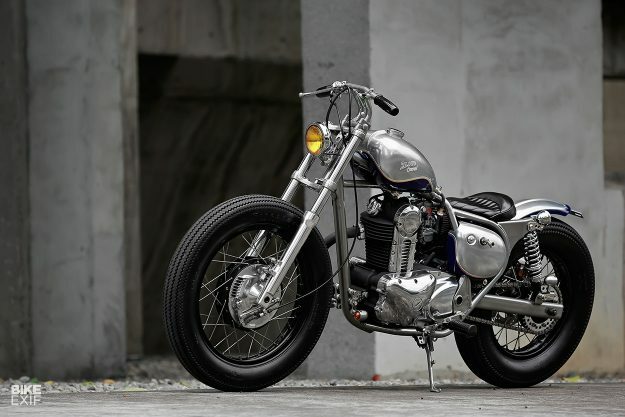 The little Kawa qualifies as a stern test for a builder, but after a session in the Taipei workshop of Max Ma, this one is almost unrecognizable. If you’re in the States, you’ve probably never heard of the BJ250—but it was a huge seller for over 25 years in the East. Launched in 1992, Kawasaki produced over 100,000 for the Asian markets. A handful also made their way to mainland Europe in the 1990s, where they were known as the ‘Estrella’ ( ‘star’ in Spanish). 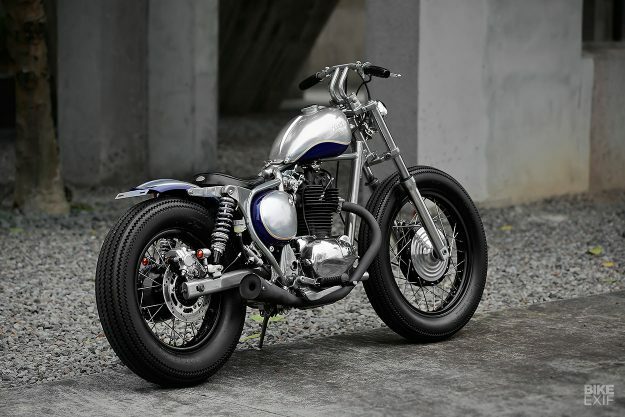 Max normally works with heavy metal such as Harley Sportsters, but this jewel-like, vintage-style bobber shows that he’s a master of small-scale builds too. He started by taking off the huge bench seat, binned the outsized fenders, and discarded the tank. The new tank, shaped in the classic peanut style, is entirely hand-made. The Taiwanese inspection regulations are amongst the strictest in the world, and forbid frame modifications. So Max has subtly trimmed the back of the frame to house a one-off shorty fender, and cleaned up all the tubing. It’s now coated it in a high-temp metallic paint that mimics the effect of metal but with a much smoother finish. To level out and improve the stance of the Estrella, Max has shortened the forks and fitted new shocks. 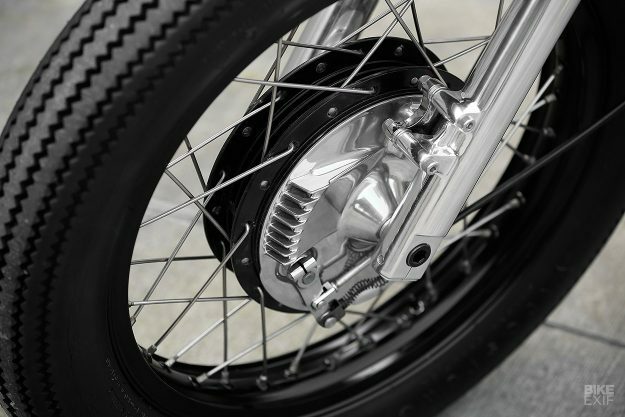 He’s also changed the wheel sizes, from F18/R17 to F19/R16 to suit the classic bobber style. The rims are finished in black high-temp paint and the spokes are stainless. Modern disc brakes look out of place on a build like this, so Max has swapped out the Estrella’s rudimentary front disc for a drum setup—taken from a Yamaha SR400. 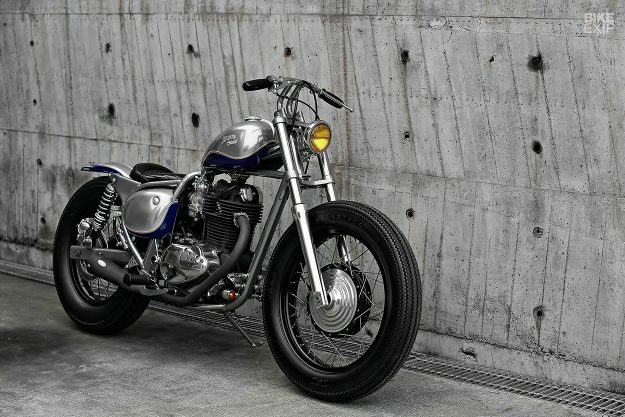 Ironically, Kawasaki themselves replaced the front disc with a drum for later versions of the BJ250. 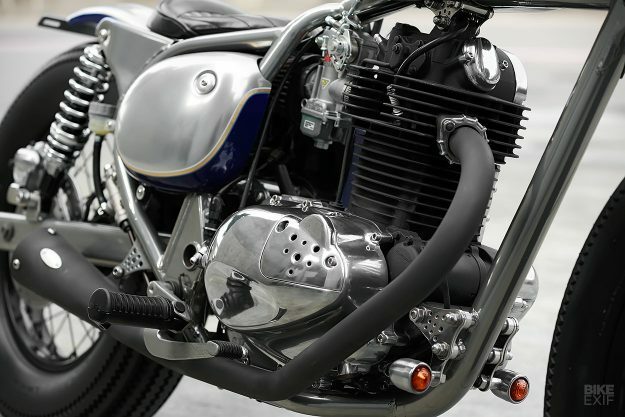 The solid 249cc air-cooled single gets a little extra pep from a new Keihin CR carb and a K&N air filter, and Max has handcrafted a free-flowing exhaust system to match. There’s a megaphone-style muffler, but we’re told that the sound is quite civilized, thanks to hidden baffles inside. The previously stifled engine now feels much torquier than stock, and there’s an upgraded clutch from the Japanese specialists FCC to match. 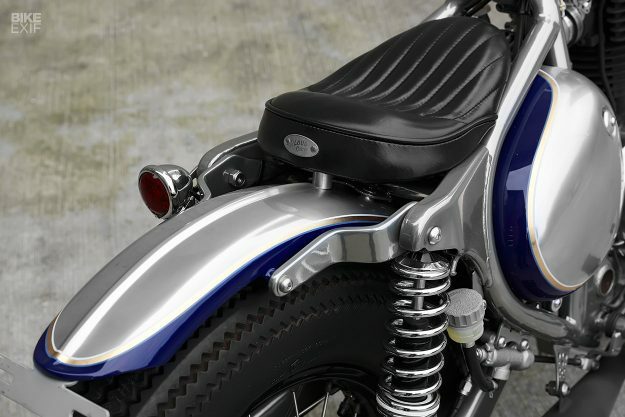 The detailing is exquisite, from the shape and quality of the leather seat to the tiny vintage lights and the multitude of discreet, polished brackets dotted around the bike. 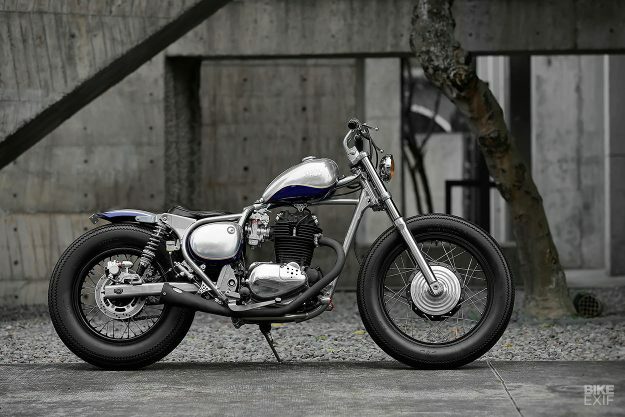 Even the T-bars, which are not a style we generally feature here, suit the bike. 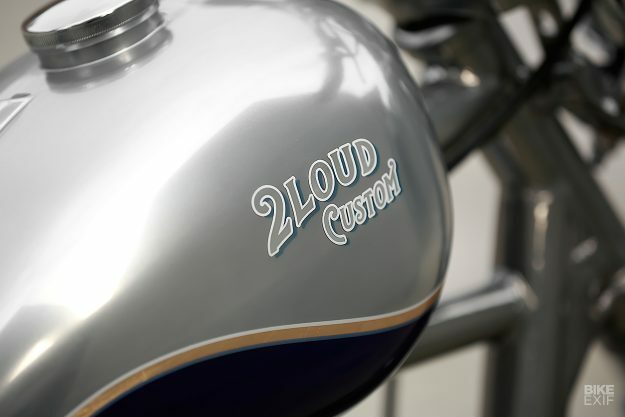 They’re mounted on a custom top yoke, and according to Max, make for a comfortable ride by lengthening the riding position on this very short bike. The wiring loom is all-new, and wherever possible, Max has hidden wires and cables inside the bars and frame. 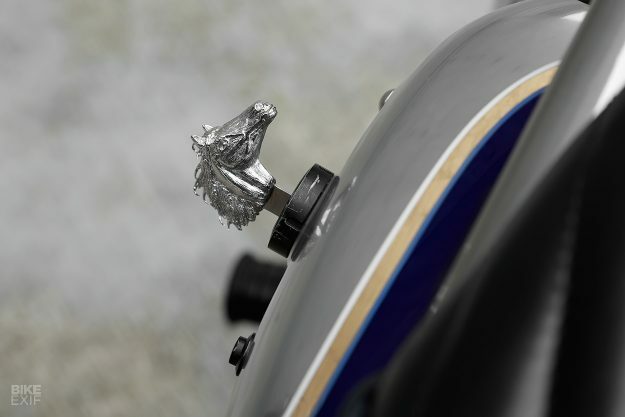 Even the humble key is more evidence of Max’s obsessive attention to detail: cast in 925 silver and then hand-carved, it’s an immaculate likeness of a tiny horse’s head. 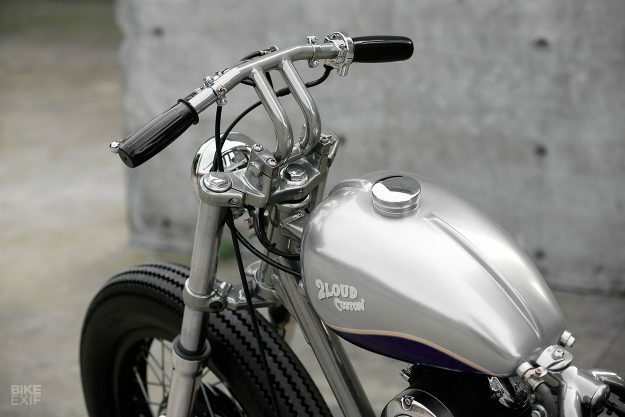 It’s an overwhelmingly monochrome bike, with silver metallic being the dominant paint color. On the sides on the tank there’s a soft wave of deep blue, bordered with a thin gold pinstripe. The effect is mirrored on the edges of the rear fender, and the only other splash of color comes from the yellow lens of the tiny headlight. It’s rare to see this level of craftsmanship on such a small bike. But as they say, size isn’t everything—and for the teeming, congested streets of Taipei City, Max’s tiny marvel is just perfect. IronX, a crypto exchange, announced on Monday that it has been approved for a regulatory licence from the Estonian Financial Intelligence Unit (FIU). This means that IronX can operate as a completely regulated exchange for trading cryptocurrencies. IronX is a joint venture between global online broker IronFX Group and EmurgoHK, the creator of the Cardano Blockchain. The crypto exchange is one of the first in Europe to apply for and receive this level of approval from a financial regulator. Estonia is well-known for being an innovative and technology-friendly country. It has built a reputation for itself as being supportive of the advancement of distributed ledger technologies (blockchain) and cryptocurrency regulation. This is why IronX chose to obtain its licence in the EU-member state, the statement said. IronX was granted the licence one month earlier than it expected. Specifically, the licence allows the exchange to be a provider of a virtual currency against a fiat currency exchange service and a provider of a virtual currency wallet service. 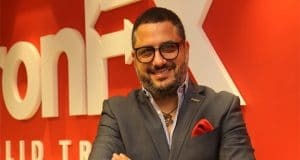 Commenting on the news, the Founder & Chairman of IronFX Group, Markos Kashiouris, said: “We have brought all our years of experience in regulated online derivative and commodity trading to create this new seamless trading platform for our customers. With the licence secured, the IronX Exchange is expected to launch its beta version at the end of this month. This will be a priority opening for its VIP IRX token holders, with the official and public launch expected to be in December 2018.